Ginger’s Garden Natural Artisan Shampoo and Beard Wash is beneficial for all hair types. The formula is balanced to clean gently and thoroughly. Scented or unscented. Ginger’s Garden Natural Artisan Shampoo and Beard Wash is beneficial for all hair types. The formula is balanced to clean gently and thoroughly without stripping. Helps maintain the hair’s natural hydration, shine and elasticity. This gentle shampoo is formulated with soothing hydrosols. 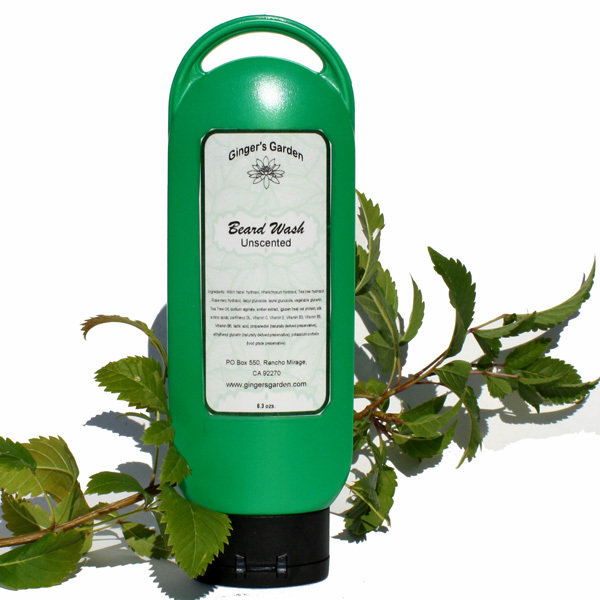 Hydrosol is a natural liquid by product from distilling Aromatherapy essential oils. Natural Shampoo is gentle enough to cleanse the beard or mustache. Unlike mass produced commercial shampoos, Natural Shampoo and Beard Wash contains no fillers or artificial colors. It's a little thinner, since it does not contain synthetic thickeners. The light color is natural from the hydrosols and the extracts and proteins. Ginger’s Garden Natural Shampoo and Beard Wash is good for your hair! Natural shampoo and beard wash comes unscented, but I can scent to order from any of the scents available on the Master Scent list page. Just type me a note in the comments section of the shopping cart which scent you would like. Ingredients: Witch Hazel hydrosol, Helichrysum hydrosol, Tea tree hydrosol, Rosemary hydrosol, decyl glucocide, laurel glucocide, vegetable glycerin, sodium alginate, amber extract, (gluten free) oat protein, silk amino acids, panthenol DL, Vitamin C, Vitamin E, Vitamin B3, Vitamin B5, Vitamin B6, lactic acid, propanediol (naturally derived preservative), ethylhexyl glycerin (naturally derived preservative), and potassium sorbate (food grade preservative). May contain fragrance or essential oil depending on the scent chosen.